One of Toledo’s greatest assets is our proximity to Lake Erie. Our community and region must do all that it can to protect this critical resource for its economic benefit and for every citizen’s health. As prices for water continue to rise, our city must work diligently to create strong municipal partnerships across county lines and city limits. 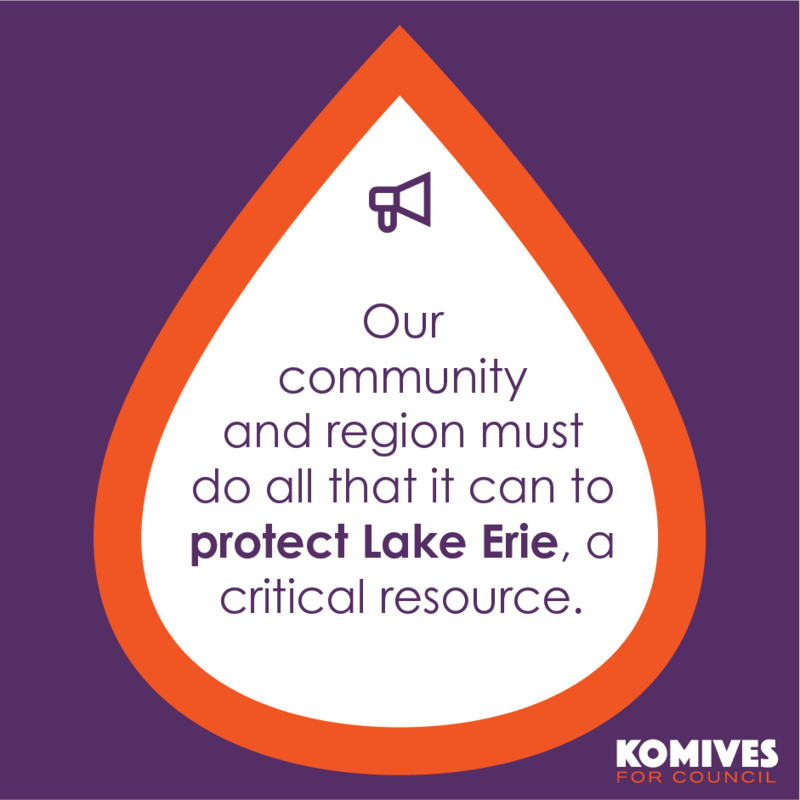 Toledo can continue to offer quality water to the region and Toledo City Council can rise as a leader in this effort. Working together also allows us to address the greatest threat to this precious resource: algae. It is true that these algal blooms are directly linked to nutrient runoff from agricultural practices. Although City Council cannot implement legal action, we can encourage best practices and responsible adjustments. These changes can easily be applied to local citizens here in Toledo, by creating incentives for property owners to utilize rain barrels, develop rain gardens and promote wildflower growth. Our region is rich in natural resources and we must do all that we can to protect these precious assets in our community. Funds are sparse and Toledo could be doing more to support conservation through programs that are aimed at helping citizens take steps to protect our environment. Our region generates millions of dollars in water tourism every year. Our city could undoubtedly benefit from policies that promote more tourism and responsible recreational usage of our water systems. Neighborhoods such as Point Place and the South End have historically benefitted from these kinds of tourism and could use a renaissance of bringing people back to the water. Area businesses will naturally feel an impact of the resurgence, helping Toledo economically prosper. This revitalization begins with sensible development along the Maumee River. Actions to create parks and green spaces, as well as thoughtful, strategic residential and commercial growth, will only enhance the experience of those living in our great city. Local water development successes like Middlegrounds Metropark prove our citizens’ interest in being near the water. Investing in other areas like Walbridge Park will bring back a booming South End economy. Improvements to Jamie Farr Park in Point Place would aid in extending this destination to the river. These upgrades would breathe new life into our already strong neighborhoods.